A research purpose is to analyze the impact of digital economy and inevitable crises on development of the territories. In the previous works the authors revealed the tendency to a setization of subjects of regional economy, including the local food markets. It became the basis for refining of prospects of network interaction of participants of the food markets in the conditions of the crises accompanying any evolutionary changes. 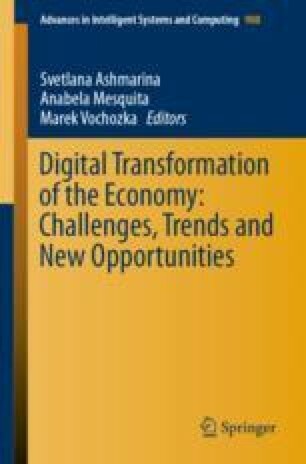 Disaggregation of a research purpose allowed to allocate several specifying problems: typology of crises; forms of network interaction characteristic of transition to digital economy; features of the food sector as subsystems of regional social and economic system; development of the food markets. Lifting consistently each of the specified problems, it was succeeded to establish that the subjects of regional economy having knowledge, experience, resources and resource opportunities create network of competences which is a relevant evolutionary form of interaction on economic space of the region. The network of competences applicable of the local food markets (the food sector of regional economy) differs in the list of participants and develops considering general and specific tendencies. The general background for development of network of competences creates transition to digital economy. Any crises act as the internal and external factors influencing this process. Manifestation of an author’s line item is that crises are considered as “creative destruction”, and the fact of availability of crises doesn’t change a general forward trajectory of development of regional economy.